For everyone who missed me over the past two weeks, I’ve completed a hellish move into temporary housing until my wife and I move into the house we purchased in mid-August. 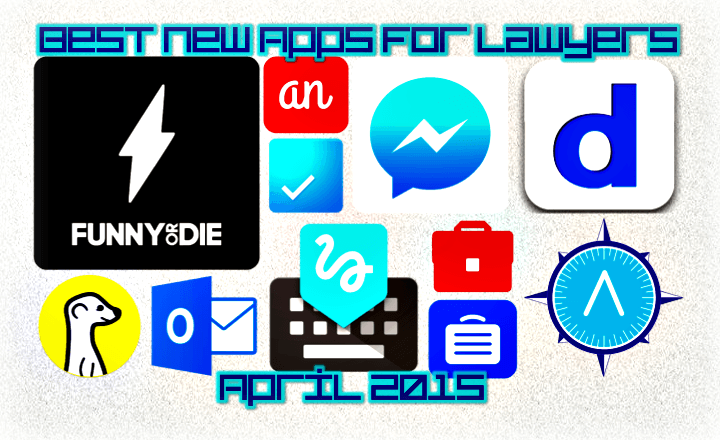 For everyone else, well, there were some nice apps released last month. Facebook Messenger by Facebook, Inc. (iOS, Android), free (Update). Facebook’s first foray into breaking its social capabilities into multiple apps got a major update last month. Messenger, the stand-alone app that allows you to send individual or group messages to your Facebook friends, added a video calling feature. You are now able to start a video call directly from an existing message, expanding on the recent introduction of voice calls through messenger. Probably the most valuable element of this new feature is that you’re able to conduct video calls between any mobile devices, regardless of the brand, OS, or network. LinkedIn Elevate by LinkedIn Corp. (iOS, Android), free. Does your law firm create its own content, via blog or social media? Do you routinely share articles and stories relevant to your law firm’s practice areas with your employees or clients? Are you simply looking for a way to share valuable content? LinkedIn Elevate might be just the platform for you. Taking advantage of your employees’ social networks, LinkedIn Elevate allows you to share the unique or important content you create or discover with a wide audience. Using state of the art analytics, find out the best times to post content so it gets the best audience, boosting your circulation and enhancing your employees’ authority with their contacts. Any.do by Any.DO (iOS, Android), free (Update). Last month, I talked about the massive redesign of the popular app ToDoist. Not to be outdone, Any.do, another of the top to-do list apps on the market, announced its own complete redesign. The app underwent a complete redesign to make sure the visual experience is identical across all platforms. However, the headline updates are to the features themselves. Any.do now allows for much faster jump between different lists, including new filtering options (by date, by list, by priority). A new zoom-in/out feature allows you to see an overview of your tasks or drill-down to details of a specific item quickly and efficiently. The feature allowing you to more easily create and share lists with specific people has also been streamlined. Marcato by Golden Hill Software, $4.99. One of the things we’re most concerned about here at The Cyber Advocate is security. And as attorneys, you should all be concerned too. Cyber Security is a major concern for law firms and clients, so it’s important to take all the steps you can to protect your clients’ information. It’s a major ethical concern as well! Market helps you do that by compartmentalizing the way you use your internet browsers. You create separate browsers that maintain separate cookies, local storage, and cache, all which live within the Marcato app. Seem trivial? It’s not. Keep, for example, Facebook from tracking searches related to your clients. Separate your financial accounts from other internet access to prevent cross-site forgery attacks. Separating personal and business data is hugely important for effective cyber security. The same should apply to your internet data. Doodle Schedule Maker by Doodle AG, free. One of my least favorite parts of litigation is trying to schedule, well, anything. Trying to coordinate between multiple attorneys, parties, mediators, experts, and everyone else is like herding the proverbial cats. Doodle, the world’s most popular group scheduling service, can alleviate a lot of that stress. The Doodle Schedule Maker app allows you to create and access schedules whenever and wherever you are. Integrating directly with your iPhone’s address book, you can easily send invitations to anyone you need to reach. Push notifications and real-time chat features make sure that you’re always notified of conflicts and able to quickly update schedules when necessary. Spring Cleaning 2 by Newton Academy, LLC, $0.99. So as an attorney, I have hundreds of entries in my contacts. Lawyers, judges, adjusters, mediators, paralegals, etc. That doesn’t even count my friends and family. Between all the different contact lists I’ve combined, there are no doubt dozens of duplicates and old contacts I no longer need. That’s where Spring Cleaning 2 comes in. Spring Cleaning goes through your contact list and allows you to quickly and easily delete duplicate contacts. Once deleted, Spring Cleaning actually saves the contact information in case you need to restore it later. If you’re tired of scrolling through contacts you’ll never call while hunting for the contacts that matter, check out Spring Cleaning 2. Funny or Die News Flash by Funny or Die, free. I refuse to take anything 100% seriously. And who really wants to take news and world events seriously (or at least completely seriously)? Me neither. Thankfully, Funny or Die is right there to do for the news what they’ve already done for the weather! Get your news headlines accompanied by a nice one-liner – just to take the edge off! Covering politics, domestic and international news, sports, science, religion, and Huey Lewis and the News (assuming they’re in the news), get all your important headlines every day. It’s better than pretending to like CNN! Android for Work by Google, Inc., free. If you use any of the Google for Work apps or partner solutions, you really need to look into this app. Android for Work is both a collection of your favorite apps, and, more importantly, a way to keep the information you work on collected, organized, and secure. Android for Work allows you to separate your personal and work data on your Android device. Anyone who has followed trends in cyber security or BYOD solutions knows how important it is to keep that information separate. Additionally, all of your work data is kept encrypted, with full support features available for your IT Manager. With additional support for policy enforcement and remote wiping of business data, Android for Work can be an integral part of your firm’s cyber security enforcement. Meerkat (beta) by Life On Air, Inc., (free). Last month, the live-streaming app Meerkat launched to massive fanfare… on iOS only. Now, Android users are able to participate in the hype, even if it’s a little late. For the uninformed, Meerkat is an app that allows you to live-stream video to your Twitter followers. Seem like a gimmick? It’s not, and it could potentially be critical for attorneys to know about and understand these types of apps, even if they’re not regular users. Microsoft Outlook by Microsoft Corp., free. Yet another app that was available on iOS while its Android counterpart sat in preview, Microsoft Outlook for Android is finally available. Let’s be honest, you probably already use Microsoft Outlook for most of your business-related scheduling and email. So this app is useful! With one unified view of your email, calendar, contacts and attachments, you’re always able to keep up-to-date on your most important items. Easily view your calendar, share availability for scheduling meetings, and update your contact information right from your Android device. The app also comes with out-of-the-box integration with OneDrive, iCloud and Dropbox, so you can save or share files with ease. Google Handwriting Input by Google, Inc., free. As many of you know, much of this blog has been about my continuing quest to eliminate the legal pad. I search for the tools and technology that will allow lawyers to replace this wasteful, yet absolutely essential, tool of the legal profession. Google Handwriting is another step in that direction! Write text on your phone or tablet (in 82 different languages – but if you could already do that, stop practicing law!) and your device will convert your writing to text. Using a stylus is optional, and Google Handwriting can capture printing or cursive writing. Handwriting even supports hundreds of emojis, making sure that you’re not writing culturally obsolete messages! (Funny or Die actually tweets recaps of popular shows entirely as emojis, FYI). If you’re interested in a challenge, Google even thinks it can translate your horrible handwriting! Briefcase by XAML Factory, free. I wouldn’t want to leave Windows Phone users out of my discussions about cyber security! Fortunately for me, Briefcase allows an excellent opportunity to include you. Briefcase is a file manager app, allowing you to manage files located on a memory card, OneDrive, or locally on your phone. Features include the ability to compress or extract files, pin favorite files to your start screen, and perform typical clipboard functions. More importantly, you can lock the files in the app using a 4-digit passcode (which you should always do!). Another Note by Pawel Huber, free. Looking for a note-taking app, but not satisfied with OneNote? You should really take a look at Another Note. An intuitive app, Another Note allows you to easily capture your notes and ideas in an organized way. Use your keyboard or dictate your notes to always keep track of your ideas. You can attach reminders to your notes, or use your notes in conjunction with your calendar, to make sure you never forget about that important assignment or great idea. Overall, this sleek, light-weight app is an excellent alternative to OneNote for your note-taking needs.